The City of Glidden accepts many forms of payment including cash, check and Auto Pay. Auto Pay is a method where your utility bill is automatically deducted from your bank account on the 20th of each month. You will receive the utility bill by the 1st of the month which indicates the amount that will be deducted. To learn more and sign-up click here. Who do I call to set up Utilities in Glidden? The City of Glidden offers electric, water, sewer, storm water, and garbage services. Call City office (712) 659-3010 Monday-Friday 8am-5pm or click here for a utility service application. Click here for a listing of other utilities offered in Glidden. The City Council meets the second and fourth Mondays of each month at 5:30 p.m. in the City Council Chamber, 108 Idaho Street. It is preferable to submit a written request addressed to the Mayor and City Council Members, c/o City Clerk, City Office, 108 Idaho Street, Glidden, IA 51443. Correspondence should contain your name, address, and phone number. Material must be submitted by noon the Wednesday prior to the Monday night City Council meeting. I am going to do some digging on my property. Who do I call to find out where the electric lines, water lines, gas lines, etc. are located? Iowa law requires that any person, homeowner, professional, public or private entity, planning to engage in any form of excavation within the state of Iowa, must notify the Iowa One Call notification system, at 1-800-292-8989, at least 48 hours prior to excavating. The Iowa One Call notification system is a free call and a free service to all persons planning an excavation within the state of Iowa. The required 48 hours advance notice does not include Saturdays and Sundays or legal holidays. Iowa One Call is a non-profit organization funded by the owners and operators of underground facilities who are required by law to belong to the system. Iowa One Call is committed to maintaining and operating a notification system efficient in relaying information and safeguarding underground facilities essential to all Iowans. Before anyone digs, they are required to call Iowa One-Call at 800-292-8989 for utility locations. Flags and paint markings are placed to identify underground piping and cables. If these markings are present in your yard or right-of-way, it is an indication that someone is planning to dig. It does not necessarily mean the City is going to dig. The locates could have been requested by the cable, gas, or telephone companies. 1. New Construction. A building permit is required for all new buildings or structures and can be obtained by calling the City office at 712-659-3010. 2. Existing Structures. A building permit is required to enlarge, alter, move, improve, remove, convert, or demolish any existing building or structure in the City. A building permit can be obtained by calling the City office at 712-659-3010 orclick here for a building permit form. You must also be aware that the building should not be placed over or in utility easement areas. NOTE: Prior to digging, call Iowa One Call at 1-800-292-8989. No, the City will not locate the lot pins for you. A licensed land surveyor can be contacted to locate the lot pins for you. If you notice a street light out, please call the City maintenance office at (712) 659-2376 and let us know the location of the street light or email the information to us by clicking here. When is “open burning” season? Burning is not allowed in the City limits. The City has a yard waste site made available for the residents east of the sewer plant. Does the City of Glidden have a severe weather warning system? Yes. The emergency outdoor warning system is activated whenever the National Weather Service issues a tornado warning for Glidden and when there are actual sightings by law enforcement personnel or other reliable sources. Three automated sirens are tested periodically. What is the City Snow Ordinance and when does it go into effect? A "Snow Emergency" means any accumulation of snow in the amount of one-half inch, or any amount in excess thereof. City ordinance prohibits any person from parking, abandoning, or leaving unattended any vehicle on any public street, alley, or city-owned off-street parking area during a snow emergency unless the snow has been removed or plowed from such street, alley, or parking area, and the snow has ceased to fall. A snow emergency parking ban shall continue from its inception through the duration of the snowstorm and the forty-eight hour time period after cessation of the storm (except when the streets have been fully opened.) The City ordinance will be strictly enforced. Please help us by removing vehicles from the City parking areas whenever the ordinance applies. The first step is to call the Sheriff Department to see if they have picked up the animal. If not, advise the dispatcher that the animal is running loose and who can be contacted if it is found. If an officer sees this occurring, or if a complaint is called in, the animal will be picked up and taken to the animal holding facility. If the owner wishes to reclaim the pet they will have to show proof of current vaccinations. They will have a holding fee plus any criminal charges that may be filed by the officer for city ordinance violations. Or, the animal can be left at the facility and an organization will attempt to adopt it out. Does the library have internet-access computers for public use? Yes. The library has four public computers in the adult department. Computer time is limited. How can I leave a memorial for a loved one? The Glidden Public Library accepts monetary gifts for the purchase of items to add to our collection in memory of a loved one. Call or stop in and specify the amount of your gift. We will send a card to the family and then choose an appropriate book and inscribe the person’s name. Each time that book is checked out; a memory of your loved one is recalled. This is a nice way you can help the library and leave a long-lasting remembrance of that special person. Can I borrow a book from another library on inter-library loan? Yes. When the library does not own a book that you would like to read, just contact us with the title and author. The library belongs to a national computer network that allows us to borrow items for you from other public libraries across the country. There is a $1.00 charge per book to help defray postage costs. What day will my garbage be picked up? The City of Glidden currently does not require recycling, but strongly encourages it. To learn more about what can be recycled click here. A recycling bin can be obtained from the City office. Additional questions can be answered by calling (712) 659-3010. I smell a gas leak. Who do I call? If you smell natural gas, leave the premises immediately and call Black Hills Energy at 1-800-694-8989 or call 911. What is a water service pipe and who owns it? Drinking water is distributed in the City through a series of underground pipes. The pipes generally are of two different types: water main and water service pipe. The water main is usually located adjacent to a street and includes fire hydrants and valves. It is owned by the City. Water service pipes connect the water main with homes and businesses. Water service pipe includes the underground pipe from the water main to the home or business and three valves. The three valves are a corporation stop, which is a valve connecting the water service pipe to the water main, a curb stop, which is a valve in the water service line between the water main and the home or business, and an interior stop, which is a valve inside the home or business near where the water service pipe enters. 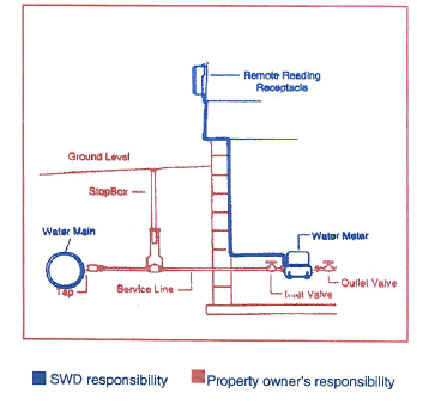 The water service pipe, including the three valves, is owned by the property owner of the home or business. As owner of the water service pipe, the property owner is responsible for all costs and expenses for the installation, connection and maintenance of the water service pipe. The monthly bill that you received from the City is now termed a utility bill. That term is used because the bill includes a garbage collection fee, storm water fee, water usage fee, sanitary sewer fee, and electric usage fee. The garbage collection fee and the storm water fee will not change from one month to the next unless the City Council approves an alteration in the fees. The water usage fee and the sanitary sewer fee are based on the amount of water used during the month. A water meter, generally located on the water service pipe inside of the home or business, measures the amount of water used. The water meter is read monthly by the City. • Additional indoor water use during the month that may have resulted from house guests or visiting family members using additional water for showers or other sanitary purposes during the month. • Additional outdoor water use during the month such as car washing or lawn irrigation. • Water leak at a point after the water has passed through the water meter. One of the common locations of water leaks in a home or business is a bathroom toilet. A faulty valve in a toilet can permit water to pass through it and into the sanitary sewer without any external evidence of leaking. If a leaking toilet is suspected, it can be checked by at least two methods. The first is placing a few drops of food coloring in the toilet tank. If the valve is leaking, the colored water will enter the toilet bowl without flushing. A second method is to record the water meter reading in the evening after all water use for the day ceases. The following morning record the meter reading. Make sure that a water softener did not cycle during the night. If the readings are different, a toilet may have leaked and registered water use during the night. Water use varies by the individual. As an average, individual water use for consumption, cooking, showers, and other sanitary and home uses is approximately 60 gallons per day. When commercial and industrial water uses are added to the individual usage, the result is approximately 125 gallons per day per person. The City’s approximately 1,200 residents use an approximate average of 150,000 gallons of water per day. How does the City treat the drinking water? The City’s water treatment plant filters iron and manganese from the raw water. It also softens the water by removing some of the hardness through ion exchange filters, much like the small home softeners. Following filtration, the water is treated with chlorine as a disinfectant, and fluoride to protect against tooth decay before it is discharged into the distribution system for use. How “hard” is the water? Hardness is the amount of dissolved minerals in the water. Because the City’s drinking water has been withdrawn from an underground aquifer, it has had contact with underground mineral deposits resulting in the opportunity to dissolve some. The hardness of the City’s raw water before treatment varies somewhat but generally averages 445 parts per million. This converts to approximately 26 grains. While the hardness of the City’s drinking water after treatment averages between 137-154 parts per million or 8-9 grains. The reddish brown color is probably the result of “rust” in the water. The rust color is caused by oxidized iron in solution with the water. Iron has been filtered from the drinking water, but some deposits in the water main remain. Despite annual programs to flush the rust from the interior of the water mains, there is still some residual. The rust will re-enter the water from the interior walls of the water main when water velocities are increased. Water velocity increases during high water usage events such as a fire or water main break. • Cold water only. Attempt to avoid using any hot water until the rusty water is clear. This will help prevent the rusty water from entering the hot water heater. If hot water use cannot be avoided, the water heater may need to be drained following clearing of the cold water. To clear the cold water, attempt to flush the home or business system through an exterior faucet. If the water does not become clear during flushing, contact the City to check the water main and flush if necessary. • Hot water only. If only the hot water is rusty, the cause may be the water heater. It is recommended that a plumber be contacted to check the heater. • Cold and hot water. The rusty water may have entered the home or business as cold water and entered the hot water heater during use of hot water. Follow the procedure for cold water only. Following clearing the cold water, drain or flush the hot water heater. A lawn meter is a second meter installed at your home that only meters the water being used from your outside faucet. A plumber will need to prepare your service for this meter. You need to request lawn meter services through City office at 712-659-3010.